Flawless, porcelain skin appeals to most people that almost everyone are always in the search for the elixir of youth to achieve this. Many products in the market today do lay claim on its efficacy to regenerate and revitalize the skin, and as good remedy for wrinkles and skin aging. My sensitive skin is of the oily type so I don’t really patronize facial creams and body lotions. I have low tolerance for that oily, sticky feel on skin. But since I’m not getting any younger, I need to find a quick fix to help reduce the appearance of wrinkles, enlarged skin pored and age spots. My skin appears to get dryer as I get older. Throughout the years, I was contented with just using a mild facial cleanser and a mild baby soap for the body. Using any product with a strong, active ingredient would be detrimental to my skin as it often causes inflammation, rashes and breakouts. But since I’m not getting any younger, I need to find a quick fix to help reduce the appearance of wrinkles, uneven skin tone and age spots. My skin appears to get dryer as I get older. I got to give it to Godiva for coming up with a hypoallergenic cleanser that soothes and softens the skin without drying it. My skin appears to be more supple and elastic after using LicoWhite™ Whitening Facial Wash (P 85) for the first time. Its non-greasy, gentle formula looks promising and appears to be suitable for my sensitive skin. While other commercial formula would foam, this doesn't. I guess it is due to that fact that is it free from chemicals. Godiva only uses natural ingredients. Godiva products are Paraben-free and makes us of Licorice extract as its a natural whitening ingredient. Their formulation promises whitening effect that will last a long time. Anyways, the herbal subtle smell is pleasing and it washes off easily. The fine lines on my face somewhat smoothened out after one week of continued used. My skin tone evened out as well. Ideal for dry skin! Similarly, using LicoWhite™ Whitening Soap on my body help do away with my dry skin problems. There seems to be a healthier glow to my skin as it appears to be more supple. I am thankful to Godiva for amazingly good results. Once the skin is cleansed, the next step is toning it using Godiva LicoWhite™ Whitening Toner. After using the facial wash, I went on to apply the Facial toner. It is so mild that there is no stinging and drying after effect as it cleans the skin pores. Most commercial facial toners do sting upon application. It effectively takes out residual dirt and I love its pleasant smell. LicoWhite™ Whitening Facial Cream (P 120) is the third step. 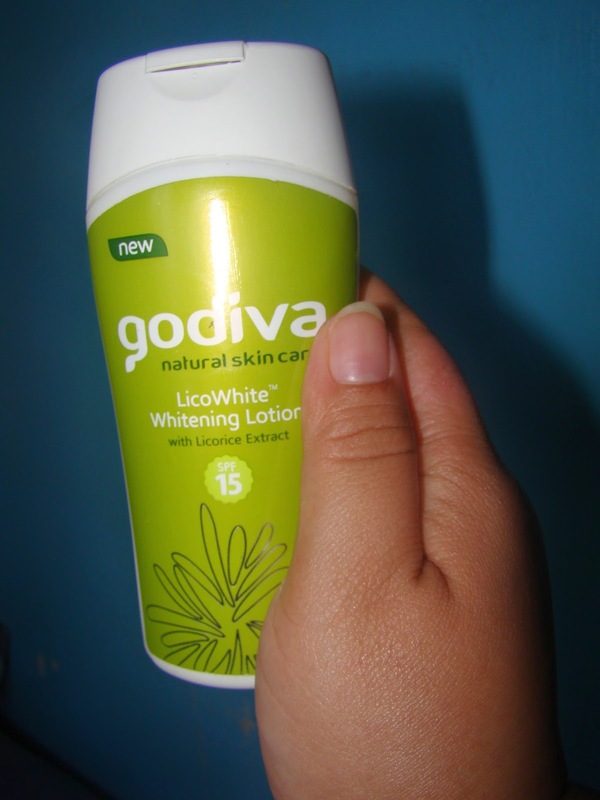 Godiva LicoWhite™ Whitening Facial Cream is a scent-free, non-sticky product. It is appears to be heavy on my combination skin that borders on oily type. It is best suited for dry skin. Though heavy in consistency, it glides on smoothly on my skin and this makes it easy to spread it evenly. What is good about this cream is that it doesn't clog my pores nor cause breakout. Godiva LicoWhite™ Whitening Lotion with SPF15 helps even out skin discolorations caused by sun exposure, ageing and pregnancy by keeping the skin soft and smooth. It contains Glabridin, a powerful skin whitening ingredient from licorice extract that is proven to be effective. It has non-greasy feel is easily absorbed by my skin there appears to be no visible difference before and after skin application. It comes in a 100ml bottle (P 120.00) and 6ml sachet (P 8.00). 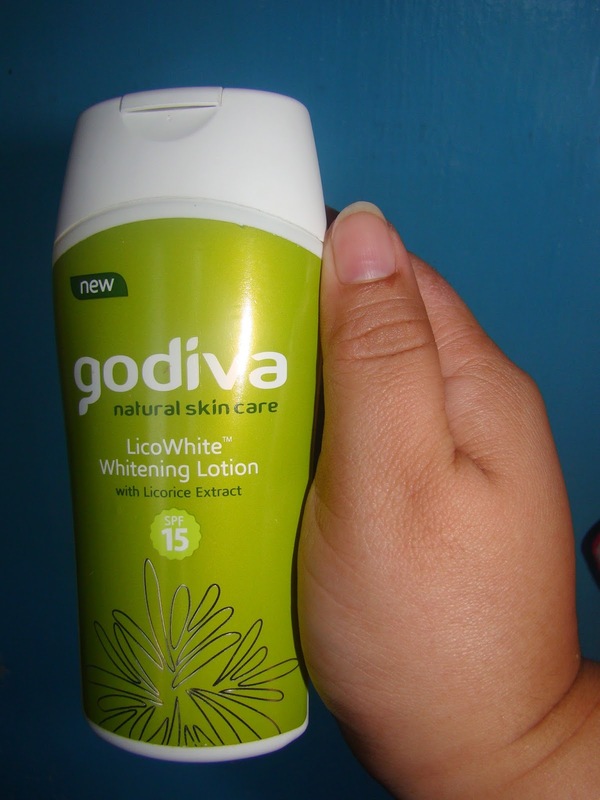 Godiva LicoWhite™ Whitening Anti-Perspirant Deodorant is at par with the commercially available anti-perspirant brands when it comes to efficacy. There is noticeable whitening of my underarms after a week’s use. I’m sure that it will surely whiten my underarms completely over time. The Godiva Natural Skin care line is indeed a product that I will actually use continously. It evened out my skin tone, made blemishes and imperfections less noticeable. I really like how my face and body appears to be more fresh, hydrated and radiant.